Acupuncture by Robbie Butler, M.S.Ac., L.Ac., L.P.N. 2016-In an effort to help those in need in the surrounding community, Notaro Chiropractic Offices donated to the Niagara Falls community mission! The turkeys Were presented by Jodi Notaro (Office Manager), Dr. Gordon and Kelsey Lynch (Assistant Manager Niagara Falls) on behalf of all of the doctors and staff at Notaro Chiropractic Offices!! 2017-Notaro Chiropractic presented two turkeys to Community Missions of Niagara Frontier Inc. for Thanksgiving meals. 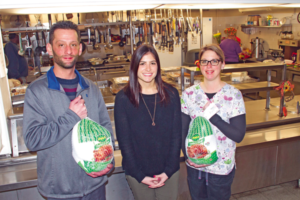 Dr. Nicholas Ryan and Jen Paonessa of Grand Island Chiropractic delivered the turkeys to the Buffalo Avenue location of Community Missions in Niagara Falls, which serves the homeless and those in need. 2017- Since 1998, Dr. Thomas Notaro has been practicing chiropractic medicine in this area. 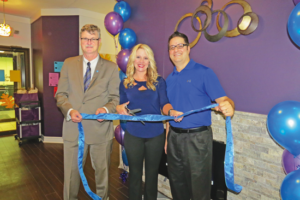 On Thursday, he and his wife and office manager Jodi Notaro cut the ribbon with Mayor Paul Dyster to a new 1,200-square-foot expansion at his Niagara Falls location. The Niagara Falls office located in the Town of Wheatfield is one of three locations. Notaro Chiropractic has additional practices located in Grand Island and East Amherst. The Niagara Falls location has been open for three years, making the expansion rather quick for a newer business. For more information or to schedule an appointment with our chiropractors or massage therapists, please call (716) 688-8815 (East Amherst), (716) 773-2222 (Grand Island) or (716) 298-0368 (Niagara Falls).